Welcome to Ibiza! We offer you the magnificent Astondoa 90 with the name "B3". With its 7 cabins and 7 bathrooms it is unique in the Mediterranean charter world. The exteriors have a spectacular flybridge deck with chillout area and jacuzzi. The interior has luxurious and exclusive finishes. 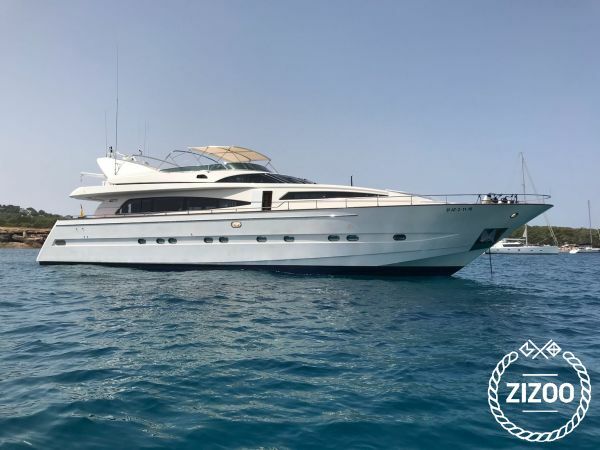 The boat is fully equipped: - It has solarium both in bow, swim ladder, a powerful 3600hp inboard engine, table, kitchen with fridge, oven, sink to be comfortable at all times. - Navigation equipment with all the navigation elements to be safe at all times. GPS, Probe, VHF. The boat has a four man crew: a captain, engineer, stewardess and cook who will give you a quality service for you to enjoy the experience. The price of the crew is included in the charter price. Extras (price does not include): - Fuel according to navigation - APA of 30% of charter price. Important information: The Astondoa 90 has no definite mooring in Ibiza. Don't hesitate, we're waiting for you on board!